Manufacturers are constantly using toxic chemicals in their products and disregard their toxic effects on our body. This is easily seen in the list of chemicals that they use. But when you create homemade products you know EXACTLY what ingredients they contain. Homemade natural skin care is easy to use, safe and an inexpensive method that does not require much time to prepare and the majority of the ingredients re already in your home. 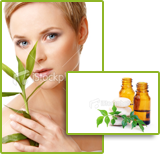 Homemade Skin Care Products. . . Gives You Control!!! Most homemade skin care products are made with ingredients you already have in your kitchen pantry or medicine cabinet. My favorite homemade skin care moisturizers include honey, avocado, mayonnaise, olive oil, and plain yogurt. Oatmeal ia a good cleansing agent, Lemon juice works as an astringent for oily skin so try that in the t-zone or oily areas of your face, milk of magnesia is a good facial mask for oily or irritated skin.